​Special Events. We Got'Em. Get Involved! Each April, the Children's Center hosts its Annual Blue Ribbon Dinner at a local venue. The event features a delicious dinner, a prize raffle, and special entertainment. This year's event will be Tuesday, April 23, 2019, at Anchors Church. A scrumptious meal will be prepared by Lee Alexander of Charlie B's Restaurant. and entertainment will be The Cotton Pickin' Kids, a group of young siblings from Hanceville that will sing and play musical instruments.. Each year, folks who buy a ticket or sponsor a table help the Children's Center provide services to abused children and their families right here in Blount County. Call 205-274-7226 to learn more about this annual event and how you can be a part of it! Blue Ribbon Dinner Raffle - Vacations, jewelry, lawn equipment, gym memberships, golf outings...these are just some of the prizes that have been won by our friends who support the Children's Center by buying a $5 raffle ticket each year. Tickets will be sold by board members and staff during March and April, and the drawing held the night of the Blue Ribbon Dinner. Each October as part of the Annual Covered Bridge Festival, the Children's Center hosts a pancake breakfast. This year's event will be on Saturday, October 27, from 7:00-10:00 a.m., at Lester Memorial United Methodist Church's fellowship hall. It only costs $5 a person to enjoy the perfect prelude to that day's festival activities downtown. Start your day with a yummy stack of pancakes, sausage, and drink, and then take in all the Covered Bridge Festival has to offer. Each year, the Children's Center takes part in the Annual Child Abuse Awareness Walk with our friends at the Blount County Department of Human Resources. Supporters - adults and children alike - convene at the Frank Green Building before traveling by foot to the Blount County Courthouse where city and county leaders proclaim April as Child Abuse Prevention and Awareness Month. Then, everyone heads to the First Baptist Church for a lunch provided by DHR employees. This goal of this annual event is to bring hope to abused children and recognize those in our community who help them every day. Each year, the Children's Center staff and board members host an Open House. The whole community is invited. This is our way of saying "thanks" for everyone's support throughout the year. It is usually held on the second Friday of December, but with construction underway, we had to postpone it. Stay tuned for details and the date! 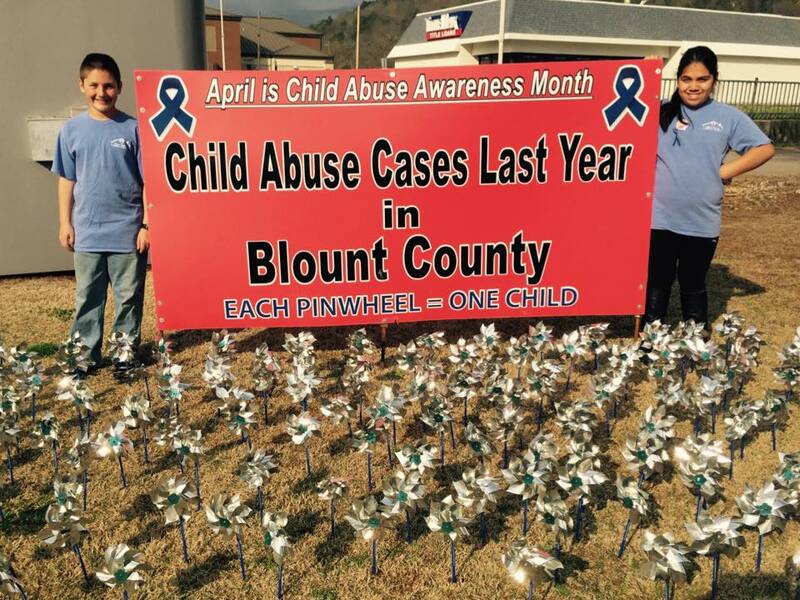 Each April during Child Abuse Awareness Month, the Children's Center displays a banner and pinwheels that represent the number of reported child abuse cases in the previous year. This effort brings to mind that it only takes a minute to make a difference in a child's life! In April, the Children's Center also sponsors an annual Poster Contest. All Blount County children in grades K-6 are invited to participate. First, second, third, and honorable mention winners are chosen from each grade and there is one overall grand prize winner. Winners receive a gift card and award ribbons/plaques. A gallery of winning posters is displayed in the Blount County Family Court Annex during the month of April. The 2019 Poster Contest Reception will be held in April 2019. Stay tuned for details.